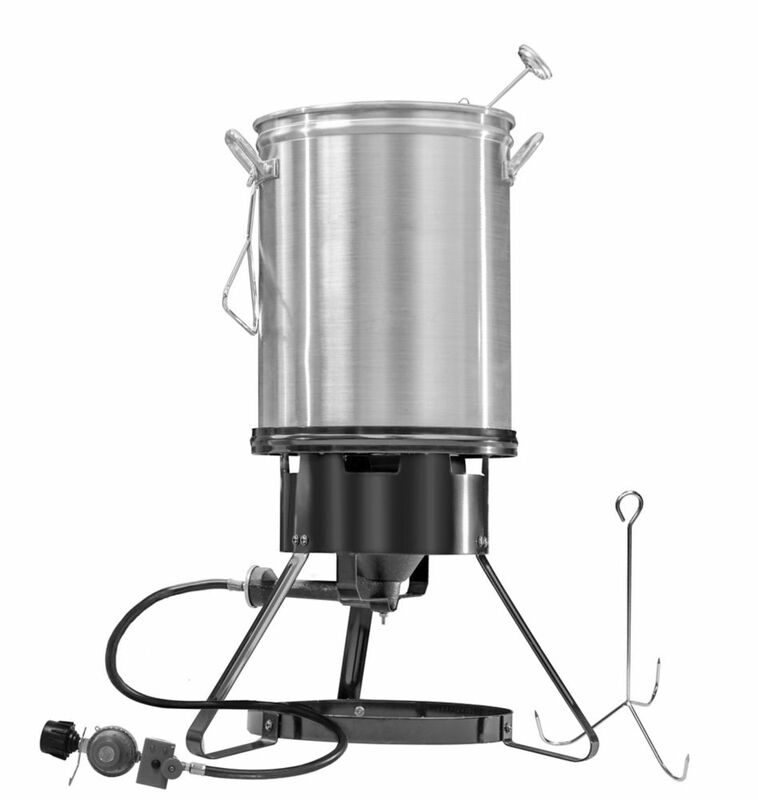 Fry or boil your favorite foods with the Masterbuilt MPF 130B Propane Turkey Fryer. The large capacity pot will safely fry up to a 20 lb. turkey. The patented electronic timer with automatic shut-off prevents overheating. This kit includes 30-quart pot with lid, turkey hanger hook, lifting hook, and an oil thermometer. Master it with Masterbuilt. The Bradley Smoker 572 sq.-inch 4-Rack Digital Smoker allows for completely controllable temperature, time and smoke settings for ease of use. An automatic wood feed system keeps the smoker running with or without your assistance for low-maintenance operation. This smoker makes it easy to roast, smoke and barbecue your favorite foods outdoors. Cook festive meals outdoors with this King Kooker 20 inch Portable Propane Outdoor Cooker with Aluminum Fry Pan. The cooker has a recessed top ring and large bottom ring for extra safety and stability, and a high pressure 54,000BTU cast burner. Cook a variety of foods in the large aluminum fry pan and punched aluminum basket with heat-resistant handle. Use the deep fry thermometer to monitor the temperature and adjust the flame with the adjustable regulator. Cook all your foods to perfection every time. Try the suggestions in the detailed instruction and recipe booklet, or create your own favorites. King Kooker lets you eat like a king. CSA Design Certified. MPF 130B 30L Propane Turkey Fryer Fry or boil your favorite foods with the Masterbuilt MPF 130B Propane Turkey Fryer. The large capacity pot will safely fry up to a 20 lb. turkey. The patented electronic timer with automatic shut-off prevents overheating. This kit includes 30-quart pot with lid, turkey hanger hook, lifting hook, and an oil thermometer. Master it with Masterbuilt. MPF 130B 30L Propane Turkey Fryer is rated 2.0 out of 5 by 3. Rated 3 out of 5 by Tricia from The aluminum seemed like it was Poor quantity. The lid had to be bent into place. I will see how ... The aluminum seemed like it was Poor quantity. The lid had to be bent into place. I will see how it cooks when we use. I had got this fryer for my husband for Christmas. Rated 2 out of 5 by Tom from Unfortunately there was some damage to unit with two dents... Unfortunately there was some damage to unit with two dents on both sides of the pot. I have pictures. But I had to use it right away so I went ahead and used it.